1. I feel honoured to address this distinguished gathering at the prestigious University of Jordan, one of the oldest andmostacclaimed centres of learning in the world. I would like to begin byexpressing my gratitudeto H.E. Professor Dr. Tarawneh for his generous words and to the University of Jordan for conferring an Honorary Doctorate on me. I am deeply movedby this gesture. I value it as a manifestation of the warmth of the people of Jordan towards me and my country. I have long been aware of the grand reputation of the University of Jordan. I have heard of its contribution in the building of a knowledge society in this country. Its role in promoting fundamental human values, academic freedom, learning and innovation has been second to none. Today, as I address you, and through you, the people of Jordan, I feel that I could not have chosen a better venue than this esteemed institution. 2. 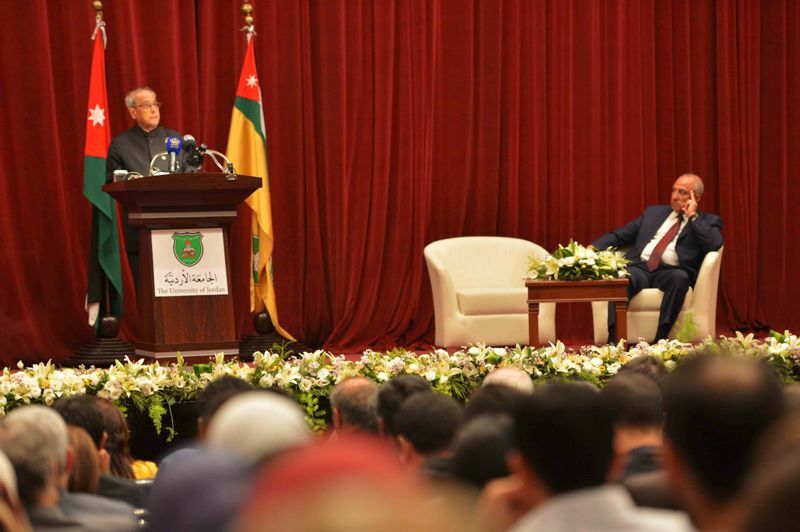 India attaches high importance to its friendship with Jordan. I have come here, inspired by our common history and encouraged by our mutual goodwill, seeking to open a new chapter in our age-old relationship. Since our two independent nations established our diplomatic relations in 1950, our co-operation has expanded in a variety of areas of shared interest.India was among the first countries to welcome the Wadi Araba Treaty of The Kingdom of Jordan with Israel in October 1994. Our nations have,over the years, consolidated our partnership by establishing institutional mechanisms andundertakingregular high-level exchanges. India values the personal contribution of His Majesty, Late King Hussein bin Talal (May his soul rest in peace) and Their Majesties King Adbullah II and Queen Rania in reinforcing the warmth and understanding between India and Jordan. This mutual sentiment has beenstrengthened by some unusual events that have become landmarks in the history of our bilateral relations: India recalls, with gratitude, Jordan’s invaluable assistance in the emergency evacuation of over 150,000 Indians from Kuwait and Iraq during the Gulf Crisis in 1991 and again in 2004 when our people fled the civil war in Iraq. Over the years, our relationship has been further enhanced by the excellent understanding between our Governments on regional and global issues and our support for each other in multilateral fora including the United Nations. Our convergence of views on Palestine, the Middle East Peace Process, Syria, Iraq and the challenges confronting us in this region today - and our agreement on the need to expedite UNSC reforms reflect our common approach to these important issues. 3. India has an unflinching commitment to sustaining and expanding relations with the Arab world. Our ties are ancient and civilisational. West Asia is a vital part of India’s extended neighbourhood and millions of Indians live and work here.We commend Jordan's active and untiring efforts for peace in the region.India has always appreciatedthe vision of His Majesty, the Late King Hussein (May his soul rest in peace) and His Majesty , King Abdullah in pursuing, with all concerned at both the regional and the global level, a just solution to the Palestine-Israel issues.Like Jordan,India’s traditional support to the Palestinian cause remains steadfast and unwavering while we pursue strong relations with Israel. Our bilateral relations with Israel are independent of our relations with Palestine. India supports a negotiated solution resulting in a sovereign, independent, viable and united State of Palestine, with East Jerusalem as its capital, living within secure and recognized borders. We desire to see Palestine living side by side at peace with Israel as endorsed in the Quartet Roadmap and relevant UNSC Resolutions. India has played a proactive role in garnering support for this cause in all multilateral fora.We have called upon both sides to exercise restraint and work towards a comprehensive resolution of the Palestinian issue. We have been happy to provide budgetary, economic and developmental assistance to Palestine. I would like to recall the words of Mahatma Gandhi, as also quoted by Her Majesty, Queen Noor in her recent book, "Leap of Faith'and I quote, "Palestine belongs to the Arabs in the same sense that England belongs to the English and France to the French". India stands ready to work with all like-minded nations for the amicable resolution of this protracted conflict. 4.India also remains deeply concerned at the ongoing violence in Syria. We are saddened by the tragic loss of lives and the long suffering of millions of displaced citizens - including innocent women and children. We laud Jordan’s humanitarian assistance and sheltering of 1.4 million refugees - despite its own severe domestic constraints; and believe that this human tragedy should never have been allowed to happen in the first place. India has been consistently calling for all sides in the Syrian conflict to abjure violence so that conditions can be created for an inclusive political dialogue. We see this as the only path to a comprehensive, permanent, political solution as there can be no military solution to this conflict. We have been stating that such a dialogue must take into account the legitimate aspirations of the people of Syria. India believes that Syria has a key and fundamentalpart to playin achieving peace and stability inWest Asia.Prolonged conflict in Syria has already begun to have a severe impact on the region and beyond. 5.Ladies and Gentlemen,the fragile security situation in Iraq is, no less, a matter of grave concern. The rise of intolerance and sectarian violence calls for a comprehensive approach for achieving a political solution in Iraq. On our part, India is committed to non-interference in the internal affairs of other countries. However, we are directly affected by terror and strife in this region. We sincerely desire stability and prosperity for the friendly people of Iraq with whom also we have close ties that are ancient and civilisational. 6.I am reminded of the prophetic words of Mahatma Gandhi, Father of our Nation, which I would like to share with you as they have proven to be more relevant now than ever before: I quote,”What difference does it make to the dead, the orphans and the homeless, whether the mad destruction is wrought in the name of totalitarianism or the holy name of liberty and democracy.?”Unquote. 7.The high academic and culturaltradition of the Arab world is not only well known to us in India, but it is inseparably linked to our own. We know that Arab masters translated and preserved teachings from Greece, India and Persia, inspiring a mass movement in the field of education during the 12th Century. This resurgence produced the great Arab mathematicians, scientists and scholars. Regular cross pollination of theories and concepts inspired thought, exploration and discoveries that changed the world. We, in India, cherished these invaluable exchanges and collaborations that enriched our traditions of learning, culture, religion, language and people to people contacts. The weakening of these links over the decades due to a variety of reasons can certainly be remedied. A re-connect of Arab and Asian ideas and culture will undoubtedly enrich humanity once again. There is wide popular support in both our countries for enhancing our relations. My visit reflects India's deep interest in strengthening our partnership with Jordan in every field. 8.We admire Jordan's endeavour, guided by the vision of His Majesty King Abdullah – II, to modernise its educational infrastructure and develop in its youth a scientific temper while preserving all the richness of Jordan’s cultural heritage. It is a vindication of your investment in these values that you have succeeded in building a modern, inclusive and pluralistic nation while the rest of the region remains entrapped in continuous cycles of conflict and instability. Your success is, therefore as important for the region as it is for the world. India has always recognised the importance of education in social empowerment and a nation's progress. This assumes greater salience and urgency at this time - when the world is tackling the challenges of unemployment and radicalization. Our strongest focus should remain on human resource development. We are happy to have partnered Jordan in training its students and professionals in India. I am told that the Jordanian alumni of various Indian universities are now 2500 strong. Our educational systems mustupgradeand fine tune themselves to better equip our youth for employment. The knowledge economy is an area where we can have promising collaborations. Friends, as Visitor of 114 institutions of higher education in India, I am deeply committed to fostering educational exchanges and cross pollination of ideas. Accompanying my official delegation are the Vice Chancellors of prominent Indian Universities and educational institutions in India. I am happy to see that Delhi University and the University of Jordan have signed an MOU for co-operation today. Several other Indian universities and premier institutions have also entered into understandings with their Jordanian counterparts. I am told that the University of Petra and Talal Abu Ghazaleh University are already in successful partnerships. Similar tie-ups for providing online education, could, if encouraged, afford vast opportunities for fruitful collaborations. 9.India is emerging as one of the largest economies in the world. It has experienced an average annual growth rate of more than 7 per cent over the past decade, and is,presently,one of the fastest growing emerging markets in the world. India seeks greater Foreign Direct Investment in the insurance, construction, defence and railways sectors. We have opened up these sectors through policies that will encourage investors. Our bilateral trade with Jordan has crossed US $ 2 billion last year and we have set ourselves a trade target of US $ 5 billion by 2025. We can achieve this if we expand the range of items in our trade basket, increase the share of high-technology and value-added products and enhance exchanges and cooperation in the services sector. Our priorities are healthcare, IT & IT-enabled services, financial services, transport and logistics. 10.India has and will remain committed to peaceful recourse in its external as well as internal policies. Instability in our neighbourhood can threaten our security and slow down our progress. At a time when the entire world is affected by the scourge of terrorism, it is important to recognize that India has been preoccupied with this menace for over four decades. Terrorism emanating from our neighbourhood remains a major security threat to us. We believe that addressing this challenge should be a major priority of the international community. India believes that countries adopting a policy of selectiveness in identifying and dealing with terrorists - especially those who allow these forces to thrive on their territories - will eventually be endangered by the very same actors. Indiacondemned the brutal killing of the Jordanian pilot , Muath al-Kasasbeh.We commend Jordan's efforts in confronting the menace of terrorism and your participation in regional and international efforts in this direction. India has been actively working for strengthening theinternational regime against terrorism. We seek full and universal compliance , by all countries , with the counter-terrorism measures initiated under the aegis of the United Nations, particularly UN Security Council Resolution 1373 (2011) and United Nations Global Counter-Terrorism (GCTS) adopted in 2006 . Indiawould like to see a collective effort by all the member States of the United Nations for the early conclusion and adoption of the Comprehensive Convention on International Terrorism. It has been pending for over a decade. This Comprehensive Convention would serve the cause of humanity by prohibiting States from facilitating or allowing their territories to be used for terrorist acts. It would enable States to cooperate in suppressing terrorism and in punishing the perpetrators, abettors, financiers, facilitators and collaborators of terrorism. 11.Friends, in my meetings with His Majesty, King Abdullah and the pragmatic leadership of Jordan, I have reflected on these concerns and objectives – particularly the goal of peace in this region. I am happy to share that I am convinced that under the guidance of His Majesty, King Abdullah II, Jordan will definitely reap the positive outcomes of all the efforts made for the development and progress of its people. The world also looks forward to the healing and renewal of the other great communities of this region. I wish His Majesty and the Government of Jordan every strength and unmitigated success as they provide leadership to this process. 12.On the bilateral agenda between India and Jordan, I am now more confident than ever before that we are proceeding in the right direction. We both realise that we must seize the present opportune moment to work together and collaborate for our mutual benefit. The understandings that have been reached during my visit will undoubtedly enhance our mutual understanding and take our co-operation to new levels. 13.Above all, Ladies and Gentlemen, as I see the young and optimistic faces of the young people around me today¸ I am inspired by the energy and hope that I perceive. I see in you the future – and a better and brighter world led by your enlightened generation. I wish all the students gathered here today every success in their academic careers. May your endeavours for peace and nation-building be fruitful. 14.Once again, I thank you all and convey, through you, to the people of Jordan , my sincere wishes for the progress and the prosperity of your great country.